Rope skipping is one of the oldest forms of exercise in the world. Professional boxers use it as a warm up and conditioning exercise. Children all over the world use it as a form of playground entertainment. 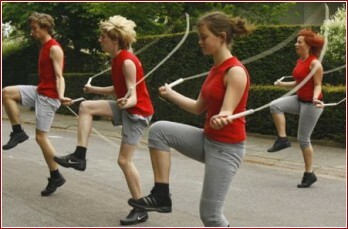 In fact, professional rope skipping is a sport now growing in popularity with children and adults alike. When you jump rope for extended periods of time and on a regular basis you can start to see your waistline shrink, your blood pressure drop, and your risk of obesity-related illness lower significantly.